For many years, GWP Chairman and CEO Melvin Clark has been a featured speaker at the Congressional Black Caucus Institute (CBCI) Tunica Policy Conference, the premier annual policy conference held in Tunica, Mississippi which is intended to elicit diverse thoughts on issues impacting the quality of life in minority communities throughout the U.S. The Tunica sessions are directed towards identification of workable solutions to problems facing minorities, and Mr. Clark’s participation in this important summit has given both a face and a voice to an historically under-utilized industry. Each year, as a representative of the African-American business community, Mr. Clark has acted as a strong advocate for small business policy reform, as well as for diversity and inclusion in the transportation construction marketplace. Mr. Clark has proposed practical and implementable answers to issues that concern both Members of the CBC and the African-American business person, and he looks forward to continuing to work that organization toward mutually resolutions. 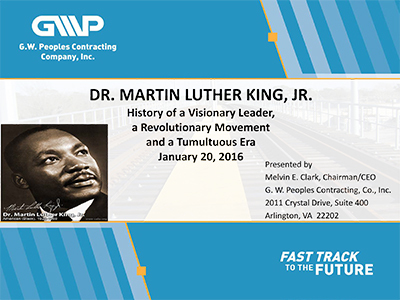 My name is Melvin E. Clark, Jr., and currently I am Chairman, CEO and Owner of G. W. Peoples Contracting Co., Inc. We are the national only African-American owned firm in the country that builds railroads. This fact simply underscores the problems encountered and the progress that has yet to be made if we – minority and women-owned businesses – are to play a meaningful role in building and rehabilitating the transportation infrastructure in America. GWP is currently t currently operates from three locations: its headquarters in Arlington, Virginia and regional offices in Chicago, IL, and Pittsburgh, PA.
GWP specializes in all elements of heavy and light railroad and transit construction including new track installation, rehabilitation, maintenance, repair and removal. GWP also offers welding services, rail adjustment and ultrasonic testing. The firm is certified as a Disadvantaged Business Enterprise (DBE) in over 40 jurisdictions, including Washington, DC, Virginia, Maryland, Pennsylvania, New York, New Jersey, California, North Carolina, Florida, Massachusetts, Texas and Illinois. I have made a personal pledge to ensure that our workforce reflects the demographics of the communities that the transit system serves. GWP has worked and is continuing to work with Urban Leagues and other community organizations and churches and that currently over 66% of the GWP workforce is minority. In fact, the recruitment processes we used for the CTA Red Line Project is being utilized as a model to provide jobs for inner city residents and to ensure diversity in the workplace on GWP construction sites throughout the country. As you also know, such a commitment is often not shared by majority firms. As U.S. DOT-funded transportation mega-projects become the trend, they require formation of joint ventures (JVs) which generally are made up of several prime contractors/majority-owned firms. We find that these JV teams tend to fulfill their DBE participation goals – if any – through historically-minority disciplines, reserving the high-end, non-traditional work (e.g., track work, A/E design, electrical structures and signals, pipework, and welding) to perform themselves. It is our strong view that all DBE goals should be applied to each phase of the project and to each individual discipline, including track work by breaking out contract work items such as track, even when the prime contractor might otherwise prefer to perform this work with its own forces. Further, we believe that it would not be unreasonable for transit agencies to insist that these majority firms not just meet the goal on the project, but strive to expand upon and exceed that minimum percentage. work into approximately one year. GWP has partnered with Dwayne Sampson, CEO of the Transportation Diversity Council (TDC), to recruit, hire and train up to 50 graduates from the Bronx Design and Construction Academy (BDCA) specifically for jobs working on the SafeTrack rail maintenance project for the Washington Metropolitan Area Transit Authority (WMATA). The BDCA offers students 21st century trade training, innovative sustainability practices and rigorous academics. Its graduates are equipped for advance entry into the competitive construction trades, and GWP has taken on and provided lodging for a number of those students to work on the intensive track rehabilitation effort on the Washington, DC Metro. In addition to the BDCA grads, of the 140 employees working on the WMATA SafeTrack maintenance project, more than 60% are minority and/or women and are residents of the DMV (DC/Maryland/Virginia) regional area. This past week, GWP sponsored in conjunction with the Chicago Urban League, a recruitment event. Due to widespread circulation on social media and my own appearance on WVON radio anchor Matt McGill’s morning news program, nearly 500 applicants showed up for jobs. These potential candidates could be put to work on GWP jobs for WMATA, the Dulles Airport Extension, or in Chicago, New York or Philadelphia, and will have transferable skills that we hope will in advance and improve the socio-economic dynamics of the nation. FRA’s program is specifically dedicated to railroads and rail infrastructure, with money going into state rail commissions. It can’t be spent any other way. However, FRA has no statutory authorization and no moral obligation, indeed, no Administrative directive to be inclusive of disadvantaged businesses. We understand that FRA is seeking this authority through legislative avenues, the statutory authority to establish DBE goals, based on the FHWA model. Members of the Black Caucus have pushed for a change from this on Capitol Hill, and we look forward to continuing to work with the CBC to progress appropriate legislative language once the study is completely, hopefully, by the end of this year. At this point in time, a 10% goal would put at least $.5 billion in the hands of minority businesses per year. The Cummings Amendment to the Highway Reauthorization bill would have modified current U.S. DOT small business size standards to be compatible and accordance with the U.S. Small Business Administration. As it stands, the U.S. SBA caps the three-year average revenue for small businesses at $36.5 million while U.S. DOT standard for small business is roughly $12.5 million lower. This is a simple fix to a big problem: in the interest of fairness and consistency and the survival of small minority owned business, the U.S. DOT should use the SBA’s size standards when making determinations with regard to small business status. GWP, with the support of partners from businesses and from the community, continues to make positive difference in the industry. GWP has extended its highly successful recruiting, hiring and on-the-job training efforts throughout the country by way of outreach to job fairs, union halls, local churches, police stations, and the Washington Urban League. Chronically unemployed individuals have been placed in positions that include operators, mechanics and laborers, and are provided skills that are easily transferable to lifelong careers. GWP remains committed to continuing to advance diversity and quality in the workplace, from the corporate offices to the front lines of construction sites. I look forward to working with the CBC towards these and additional practical and implementable solutions to our mutual concerns.